Feliway is a synthetic copy of the cat pheromone: the so-called feline facial pheromone. This cat pheromone is released by special glands and are produced from glands around your cat's mouth, mouth and chin. By rubbing its head along objects - the typical behaviour that everyone with a cat will recognise - the cat gives off the pheromones to its surroundings. This way, the cat marks its territory, within which it feels safe and at ease. The natural marking behaviour with pheromones is essential for the well-being of your cat. The pheromones that a cat releases into its environment by rubbing give it peace of mind, security and confidence. These feel-good signals help the cat to overcome any stress situations and to feel at ease in its environment. If the comforting facial pheromones are missing, for example because the cat is too stressed or enters a new environment, Feliway can help to restore the cat's well-being quickly and with ease. In addition, a new variant of this product has recently been launched: Feliway Friends. This is made using Cat Appeasing Phermone (C.A.P). This is a pheromone that the mother cat releases when she has kittens, to make them feel safe and build a bond together. It helps to reconcile conflicts and tensions between cats inside, and helps them live in harmony. As indicated above, Feliway products are in fact a copy of the cat's original pheromones. Therefore, it has the same positive features, giving the cat a soothing and safe feeling. The cat facial pheromones issued by the various Feliway products are not detectable by humans. In which situations can Feliway be used? When your male or female cat marks its environment by spraying and/or peeing indoors, this can have several causes. However annoying this may be, it is a natural way for the cat to communicate with its environment. Both neutered and non-neutered cats mark their territory by spraying. However, there is a difference in the frequency with which this happens. It is not uncommon for cats to spray in stressful situations or to urinate in the house. However, if a habit seems to develop where the cat sprays several times a day and in new places, this may be a sign that the cat does not feel comfortable in its environment. 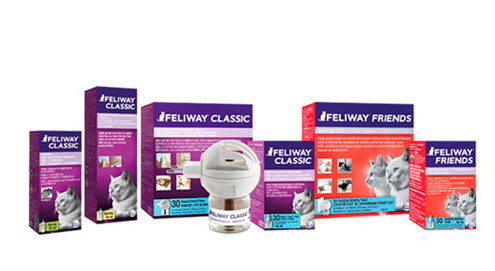 For the treatment of spraying behaviour, the Feliway diffusers are the best alternative. Place this in a socket in an area where your cat sprays. For additional support you can use Feliway spray to apply to specific areas where the cat is spraying. If the bottle inside the diffuser is empty, you can replace it with a Feliway refill. When a cat shows scratch behaviour and destroys furniture, wallpaper or carpet, it does so mainly to mark its territory. Excessive scratching behaviour generally has nothing to do with nail care. To mark the territory towards other cats, cats usually scratch on visible places - often near resting spots. In order to mark the territory more strongly, cats usually scratch in the same area over and over again. Such scratching behaviour indicates insecurity: the cat does not feel completely safe in its environment and therefore needs to mark its territory over and over again. If your cat is scratching in unwanted areas, you can use Feliscratch. Feliway spray is ideally suited for treating unwanted scratching behaviour. By applying Feliway spray to places where the cat scratches, you give the cat a sense of security, eliminating the need to mark the territory over and over again. Cats are terrestrial animals that mark their environment with both visual characteristics as well as smell. When you move house or renovate or refurbish the house (e.g. when purchasing new furniture), the visual and scent marks that the cat has previously applied disappear - and with them the feeling of familiarity and well-being. In addition, cats tend to go far from home in a new environment - with all its possible consequences. With Feliway diffuser you can help your cat feel at ease in a new environment. The presence of the reassuring pheromones makes the new environment feel somewhat familiar. It is therefore recommended - if possible - to place the diffuser in the new home some time before moving. It is also wise to use the Feliway diffuser inside the old house to relax the cat and prepare it for the relocation. Cats are generally anxious animals. Therefore, loud and especially unexpected sounds and a lot of noise can be a stressing factor. Birthdays with many guests - possibly combined with moving furniture, causing the cat to change its territory - and New Year's Eve are therefore not the most enjoyable days for cats. The stress caused by the crowds and noise in their surroundings is often expressed in spraying and unwanted scratching behaviour. During these days, when your cat has an additional need for safety and security, Feliway's diffuser may be the solution. To allow sufficient time for the comforting pheromones to spread, it is recommended that the diffuser is plugged in about a week before the day(s) in question. Cats are very sensitive to changes in their rhythm and environment. Transporting your cat - for example for a visit to the vet - is therefore an extra source of anxiety and stress. To make it easier for you to transport your cat and to make it a little more comfortable for your cat, you can apply the Feliway spray to the transport box about 15 minutes before departure. If the cat looks different after a visit to the vet (e.g. due to a collar or Medical Pet Shirt then it is possible that other cats that may be present will react differently to the 'patient'. Using the Feliway diffuser, you can help the other cat(s) to accept the 'patient'. Sometimes it is necessary to temporarily house your cat in a cat boarding facility (cattery) - a new environment that naturally brings the necessary fear and unrest. Feliway spray can make your cat's stay in the guesthouse more pleasant. For this, the temporary stay should be treated with the spray fifteen minutes in advance, so that the calming pheromones have sufficient time to work in and give off the calming substances. By plugging in the diffuser a few days before returning home, you can make your cat feel more at ease in the family home. In a house in which several cats live together, complex social structures can arise - from harmonious coexistence to intense conflict. For the owner, it is often very difficult to find the cause of conflict. A tense situation leads to restlessness and stress with all the consequences that entails - spraying, unwanted scratching behaviour, etc. Feliway Friends diffuser can help to balance the relationship in a multi-cat household and restore peace. It can be effective for example in staring, blocking, fighting, chasing and conflicts with or without spraying. However, it is important to first take the necessary standard measures: make sure there are enough litter trays (number of cats + 1), feeding and drinking facilities and hiding and/or resting spots. The rule of thumb that is often used is: no more cats in the house than available rooms in which they can withdraw. Do you have any questions regarding dental care for dogs or cats? Please contact our vet on telephone number 020 3191 8322 or by e-mail: veterinarian@vetsend.co.uk. Helps relieve cat stress and anxiety. Redirects and prevents inappropriate scratching. For tension, anxiety and behavioural problems.